As a Hawaii Photographer, I offer affordable Honolulu Corporate photography services with beautiful Oahu Seascapes and landscapes for a backdrop. 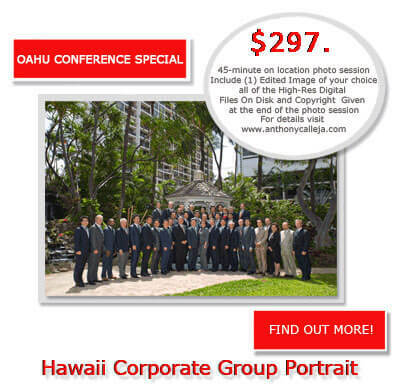 Aloha, welcome to the Hawaii Corporate Group Portrait Photography Services section of my website. If you are in need of a photographer to photograph group portraits for your Corporate Event, and Business Conference Meeting. I will come to your Oahu location. If you would like to add the name of your Company or Conference and Date of the Event. I offer the option to add text to your image. Rate $35.